Who doesn’t love pizza? Especially, if its home-made and made with a complete Indian desi twist. That’s exactly what I’m bringing to you here, pizza this simple and delicious is impossible not to try out. Store bought ready made naan, your choice of fresh vegetables, super quick and easy pizza sauce, fresh shredded mozzarella cheese and the grand show stopper is small cubes of paneer marinated in a special sauce for about 30 minutes and topped onto our special naan pizza. Pizza is one food that is enjoyed by many whether you’re a young child or a grown up adult. It’s made in many different variations, flavors, styles, topping and sizes. Different cultures have adapted their own style and taste. 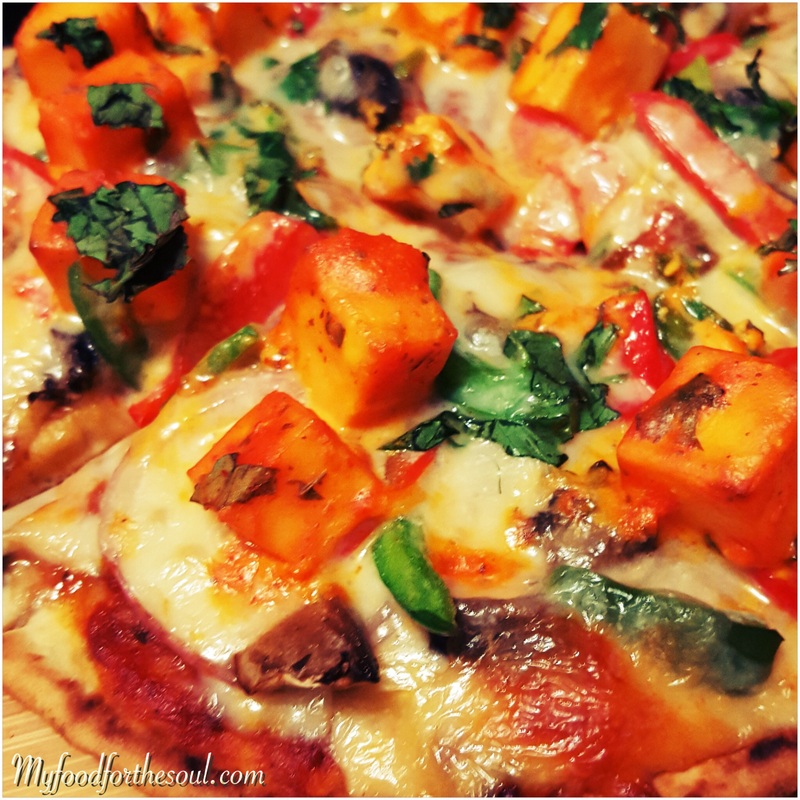 Pizza can be made for vegans, vegetarians, meat lovers, lactose intolerance or gluten-free. They can be made on whole wheat, white or gluten-free dough, store-bought naan, flat bread, bread, pastry sheets. The ideas on making pizza are phenomenal, I think that there is no right or wrong way of making pizza. Marinated Paneer Sauce that I’ve created here is super simple and tasty, it doesn’t have the tandoori flavor, but it does have a nice spicy tangy flavor. Simple ingredients like plain yogurt, kesuri methi, red Kashmiri chili powder, turmeric powder (haldi), salt, besan (gram flour),garlic, ginger, freshly chopped coriander (cilantro) and little bit of orange food coloring to give it a nice bright color. All mixed together into the small cubes of paneer and marinated for about 30 minutes. This is a partial cheat recipe, I’ve used store-bought naan and also store-bought pizza sauce which I’ve flavored up with my own seasoning. This was my quick and easy version of making pizza. Dinner was all about pizza and I wanted my family to enjoy many different variations and flavors, so that was when I had decided to make pizza on naan bread. 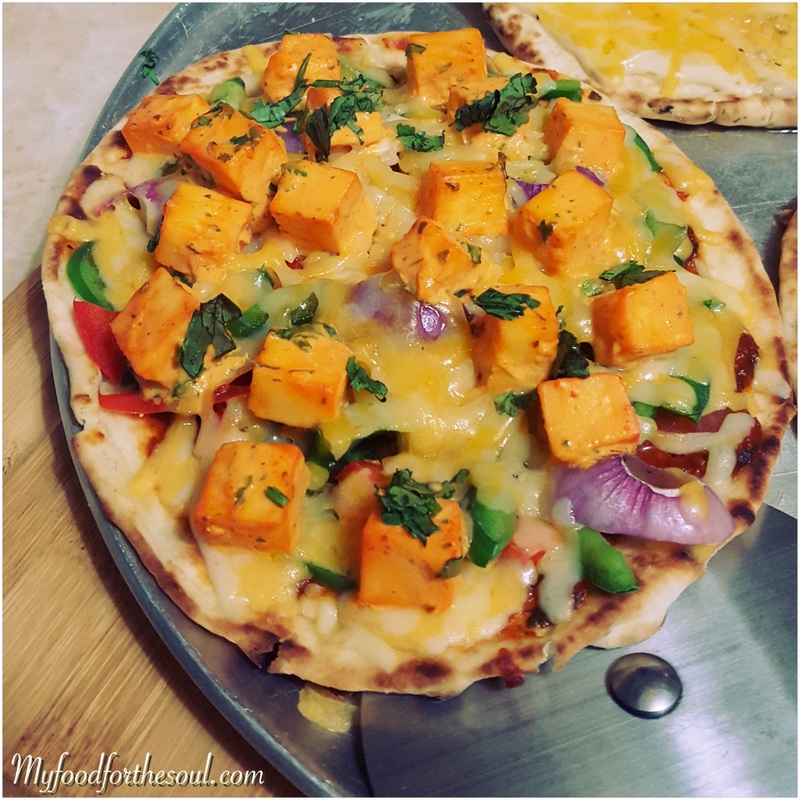 I had made Marinated Paneer Naan Pizza, Mediterranean Naan Pizza, Alfredo Naan Pizza, Alfredo Cheesy Naan Pizza and a basic Veggie Naan Pizza. 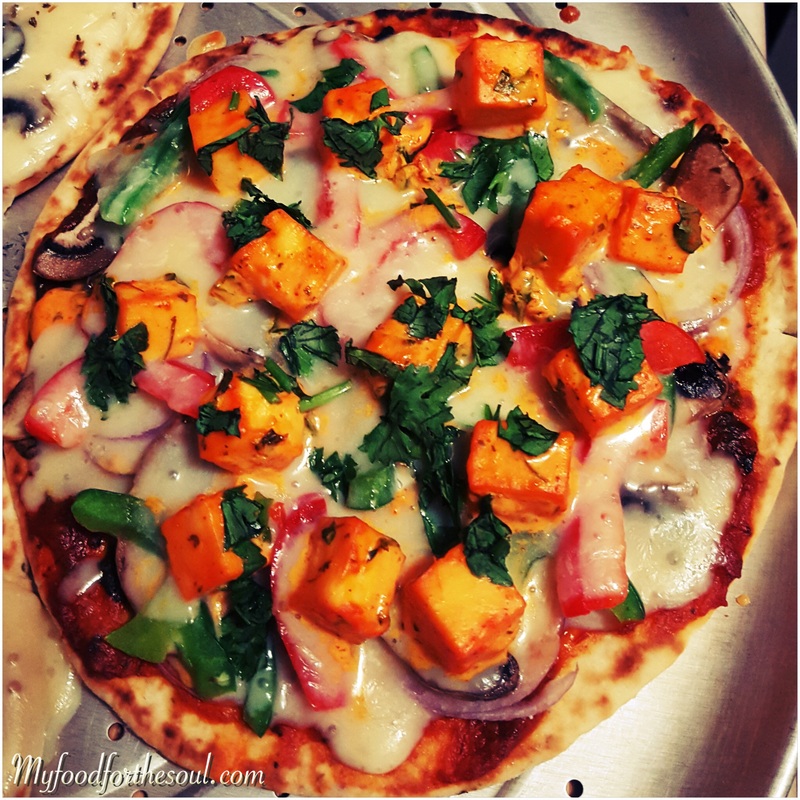 Besides from marinating the paneer cubes, the total time to prepare and serve the naan pizza was approximately one hour. When served nice and hot right from the oven to dinner table is ultimately unbelievable. Into a bowl combine all ingredients for the Paneer Marination Sauce. Give the paneer mixture a good mix to make sure all paneer pieces are coded. Cover and keep aside for 30 minutes. Into a small pot, warm up Olive Oil on medium heat. Once warm add in finely chopped garlic and saute for 1 minute. Add in pizza sauce, Italian seasoning, red chili flakes, salt to taste and freshly chopped basil leaves and cook for 10 minute on medium-low heat. Once ready keep aside. Pre-heat oven at 425°F for 15 minutes. On a round or square pizza dish, place two naans side by side. Spread pizza sauce all over naan, sprinkle some mozzarella cheese on both naans, and then evenly top with bell peppers, mushroom and red onion and the remaining cheese evenly between the two naan pizzas. Place into oven for 15 minutes, until cheese is nice and melted and the paneer is slightly golden. 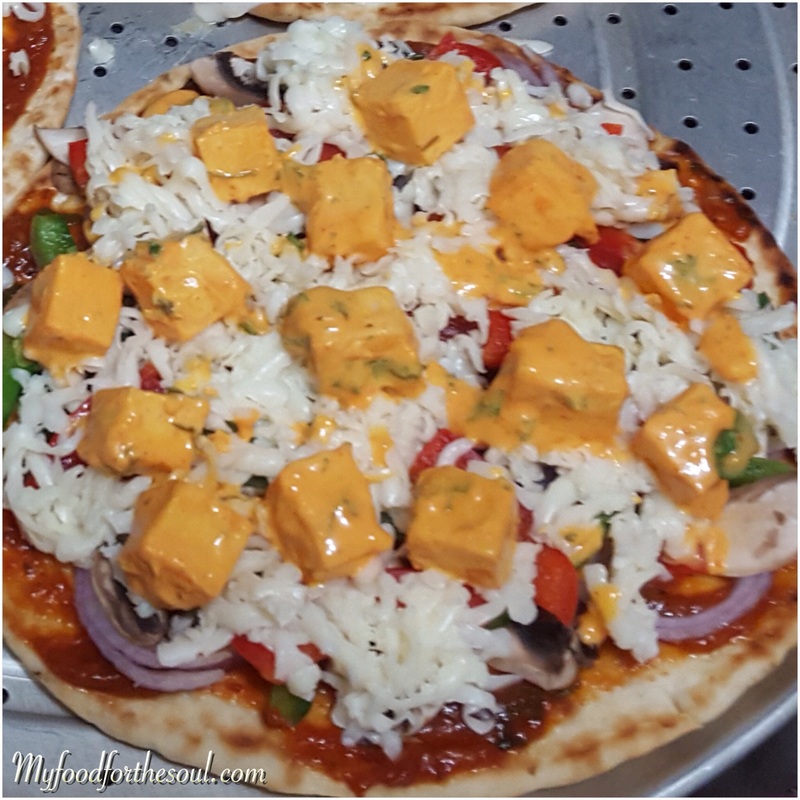 Once ready remove from oven and let Marinated Paneer Naan Pizza cool down for 2-3 minutes and cut as desired. For extra crisper paneer cubes, leave pizza in oven for extra 5 minutes. Make sure to keep watching so the naan doesn't get burnt. Onion and Garlic is optional can be omitted. Orange food coloring is optional, but it does give a very nice look to the pizza. I hope you enjoyed this recipe, please be sure to leave me your comments, feedback or suggestions I’ d love to hear from you. Also continue to follow for some more great easy, simple and delicious pizza recipes.